St. Roch has athletic programs for grades kindergarten through eighth grade. The goal of the athletic association is to allow every boy and girl the opportunity to participate in athletics and by doing so, develop discipline and respect, build character, and gain an understanding of the value of teamwork. Volunteers staff the athletic association and coach each grade’s teams. These aftercare programs offer our young students at St. Roch an opportunity to become creators and artists. They make crafts and create projects using their imaginations. This imaginative play/creation fosters their creative development while having fun. 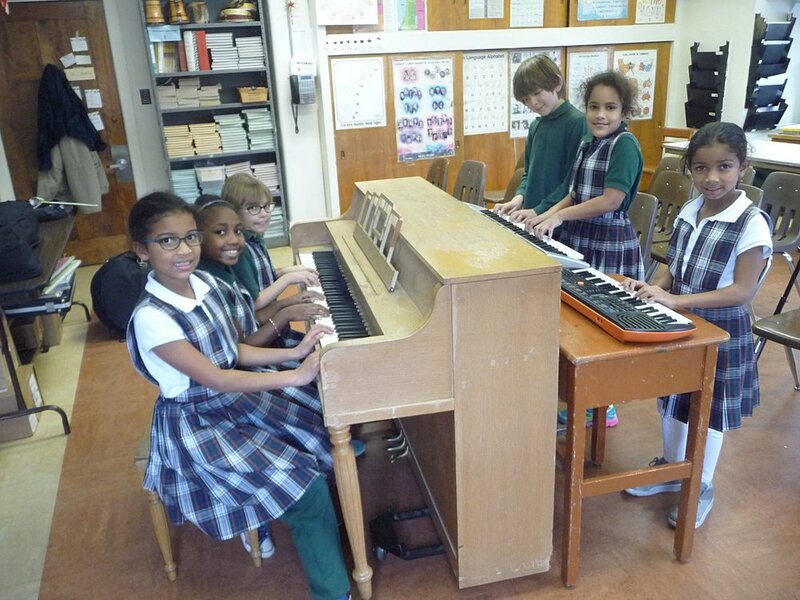 Music lessons are available after school on Wednesdays throughout the school year. All classes are taught by certified and experienced educators with lessons that teach to Missouri state standards. The lessons are available for children interested in playing any brass, woodwind, percussion, or string instrument for a fee. Bellarmine Speech League develops and improves students public speaking skills by having them memorize and perform material in Humorous, Serious, and Duet categories. Students compete in three speech meets with teams from other schools during the school year. Ribbons are awarded to participants based upon the total score received from two judges. St. Roch Chess Club meets weekly from late January through early May. In the first 8-week session, students learn chess strategies and play a lot of games for fun. In the second 8-week session, students play for fun and compete in a round-robin tournament. Trophies are awarded to the top three players. Students have fun while enjoying a snack and improving their chess skills! Cub Scouts promotes activities that lead to "personal responsibility, self-confidence, social skills, respect, and honesty". This program for young boys builds character, trains them in the responsibilities of participating citizenship, and develops personal fitness. The Health and Wellness club focuses on 2 basic things: nutrition and movement. Each meeting, the students start with an exercise such as a boot camp style workout, Pilates, or Zumba. The students then get a healthy snack related to the topic we are on for that specific meeting; if our meeting is focusing on hydration, we will provide the students with hydrating fruits and fruit to add to their water to encourage appropriate water intake. Finally, we spend the last part of the meeting on the specialized topic with a presentation and game. The students leave with an increased knowledge about their personal well-being and the confidence and motivation to keep their bodies' healthy. Armed with a positive outlook on themselves and their nutrition, students will have a clear and positive mental state as well as improved social relationships. This club is for inquisitive students or those who just like to have fun thinking. The clubs meet after school for one hour from October through May. During their time together, they solve challenging problems, learn new games, play old favorites, investigate new topics, and enjoy mathematics and science. They also share a snack. Makerspace is a hands-on, do-it-yourself club where our students gather to create, invent, learn, and build. We generally have a variety of software, electronics, crafts, hardware supplies, tools, and more available for student use. Many projects and tools will be technology-based but not every activity will have a technology component. Example projects have included a cardboard challenge, Lego wind-powered building challenges, paper electrical circuit, light up crafts, and brush-bots robot creation. The purposes of the clubs are for those children who enjoy reading to read new books and discuss those books with others. The groups meet monthly, share a snack, have book discussions, and conduct student-lead book talks to interest others in new books. The program is divided into two groups by reading levels and interest levels. The "St. Rochin' Robots" participate in St. Louis University High School Clavius robotics program. The Lego Robotics program is introduced to all students in those grades as part of the regular technology curriculum. Those students who are interested in learning more about robotics and programming are able to join this after school club to work on additional challenges. We attend the annual Clavius project robotics jamboree each January at St. Louis University High School. The club runs from September to January each year. This is a before-school activity for students in Grade 7 & 8. Students meet on Tuesday and Thursday mornings from 7:45 a.m. to 8:15 a.m. from September 1 until we break for Christmas. Students work together to prepare a 30 minute program of religious and seasonal selections. Then, during the month of December, they perform at various venues throughout the city. This activity is part of St. Roch School's community outreach and service hours are earned for the public performances. This is an after school activity for students meeting on Mondays from September 1 through March 10 to create a full-color yearbook, using an on-line software program. Students also learn how to take quality digital photographs for use in the yearbook as well as layout and design for the finished product.